Talk of a bout between the pair first came to fruition after St-Pierre signed a new four-fight deal with the UFC in February. It gathered further pace when St-Pierre claimed his second stint in the UFC could see him fight in the lightweight division, a statement many interpreted as the GSP revealing his zest to fight Mcgregor. Later St-Pierre shut down the rumor during the built up of UFC 217 while speaking to ESPN. He’s the money fight. But I don’t challenge guys that compete in lower weight class divisions. For me, I don’t do that. I’m going up to fight Michael Bisping now. I’m looking up. “He’s an amazing fighter, it would be an amazing honour, but I don’t know. I don’t know what to say. 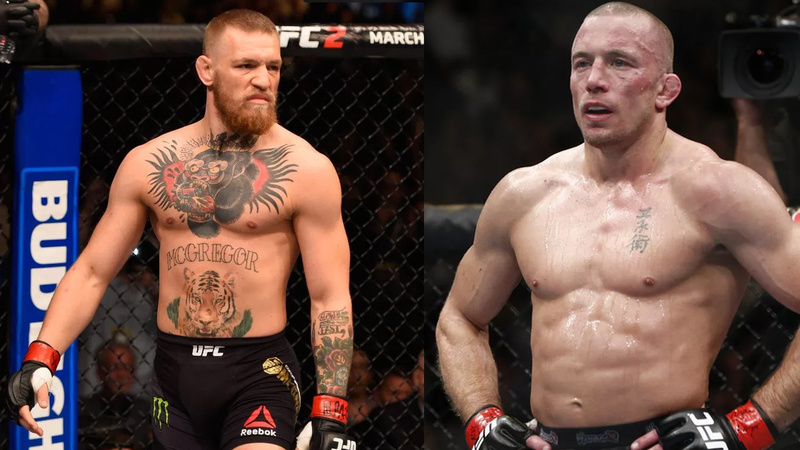 Would a McGregor and Georges St-Pierre matchup be the biggest fight in UFC history? The head coach for Georges St-Pierre Firas Zahabi spoke recently to Express Sport, who admits he’s been trying to get GSP a fight with Mcgregor for the better part of 2017, however, Mcgregor went on to fight Mayweather, and St-Pierre scores the middleweight title from Bisping. “I don’t think that’s crazy. I’ve been asking for that fight for over a year and a half now,” Zahabi said. Coach Firas believes the UFC brass would be foolish not to make the fight happen. Both St-Pierre and McGregor are on the sidelines for the foreseeable future. GSP is dealing with his colitis a medical condition, while Mcgregor is looking for a lucrative deal to come back to the octagon. Coach Firas said that both McGregor and GSP accomplishments are unbelievable and that it just makes sense for them to go at it in the Octagon. Moreover, Mcgregor’s handiwork and striking are incredible would cause some stir for St-Pierre. “I think Conor McGregor is a two-belt champion, two division champ,” said the Tristar Gym head coach. “He’s got the touch of death in his hands. He knows what he’s doing, he’s highly intelligent, highly captivated, he’s extremely dangerous. And I don’t think he fears anybody. Firas said, should their fight ever come to fruition, no doubt it will be the biggest fight in UFC history and can break the record on PPV. How many of you want to see St-Pierre and Mcgregor’s super fight?